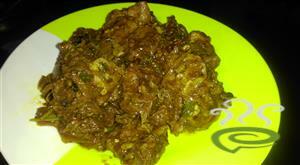 Mutton Chilly Fry is a tasty mutton preparation with chilly flakes. 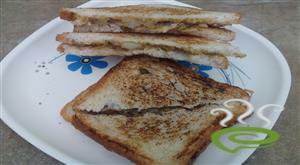 This is a very spicy and exotic dish that goes very well with rice or roti. The dish is unique and special with marinated mutton cooked with spicy aromatic ingredients. 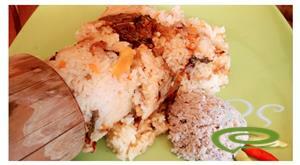 Mutton is nutritious, rich in protein and other vital ingredients required for body. You can explore a well detailed Mutton Chilly Fry here. Mutton lovers, do not miss the wonderful dish. Please check out the video also. Marinate the mutton with turmeric, chilli powder, coriander, garam masala, Pepper powder, Jeera powder, salt and 1 tsp of coconut oil. Keep this for 20 minutes and Pressure cook the mutton without water. It takes about 25 minutes to 45 minutes to cook properly based on the mutton. 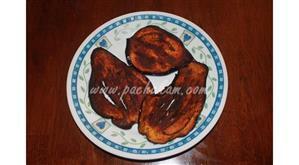 Heat pan, add coconut oil 2 teaspoon, fry the coconut slices. Then add onions and green chillies. Fry till the onion become soft and change color into brown. Add ginger garlic paste and fry until the raw smell is gone. 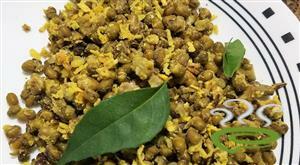 Add crushed chilly flakes and fry it for few minutes and curry leaves and fry. Add the mutton and cook it for 10 minutes in low flame. Adjust the salt. Add 1/2 tsp garam masala and mix it well and make it dry until it becomes brown color. Add fennel powder, mix it and switch off.